This image and post is somehow a tribute to the person that first guided me through the marvels of the underwater world, he is the owner and dive master of Aquaventura Diving club, and one of those persons that seems were born underwater, not only because they have the coolest pose while diving (as you can appreciate on the image) but because they have the ability to inspire either highly experienced divers and those who enter the water for the first time. 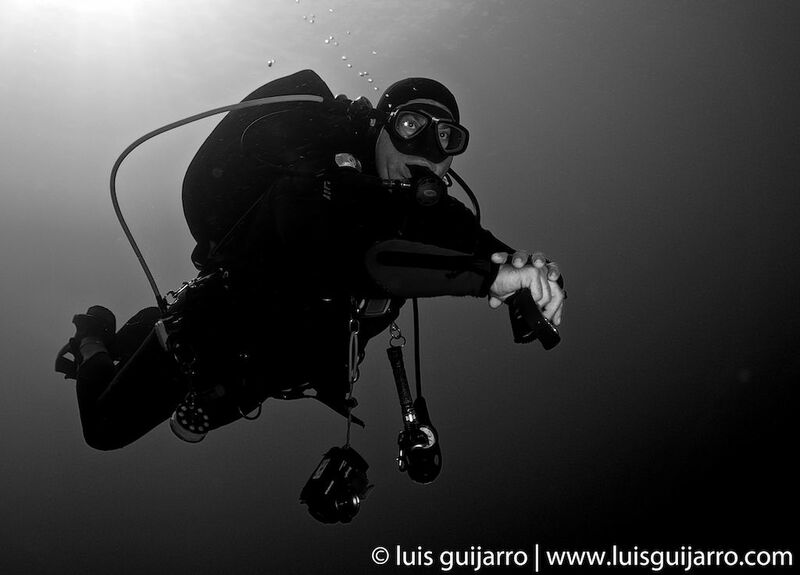 Thank you Jose, for all the great minutes and experiences we have shared underwater, and for inspiring me and many others in this awesome and magic world. Hope that we will enjoy diving together many years ahead. As for the image,though it was taken in color originally, I have decided to convert it to Black & White, since to me color does not really bring anything in images of divers only surrounded by water, and gives this halo of mistery and peacefulness.